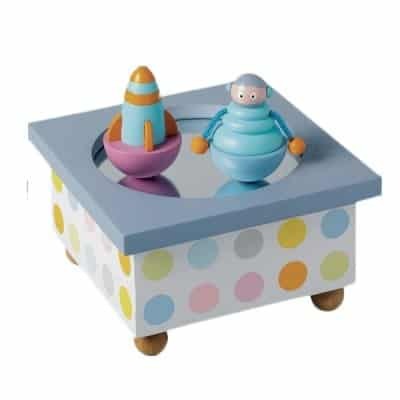 This is a wonderful piece from our Christening gift for boys range: A wooden musical box by French toymaker Trousselier. The Rocket and Robot characters spin when the music plays. Once you wind up the key underneath the characters will dance until the music stops. This is very suitable for a boy and makes a fabulous gift to be used both as nursery decoration and a toy. Not suitable for children under 36 months as it does contain small parts (the characters are detachable) which could present a choking hazard.